L&R Raises Much Needed Funds for Charity! 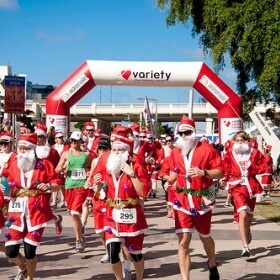 On Sunday, Team “Lambert & Rehbein” took part in the Brisbane 2011 Variety Santa Fun Run, hoping to raise some much needed funds for Variety, the Children’s Charity. Dressed eagerly in their Santa Suits to run (or maybe walk!!) with thousands of other Santa’s to raise awareness and funds for Variety, the team were excited to be a part of this awesome fun run and helping a great cause. For the second year running Team “Lambert & Rehbein” were the winners of the “Biggest Corporate Team Entry”. Variety, the children's charity empowers children, who are sick, disadvantaged or have special needs to live, laugh and learn. Variety Queensland receives requests for over $350,000 worth of urgently needed medical and mobility equipment, learning aids and other vital support each month. Variety receives no government funding and relies on the generous support of donors, volunteers and corporations to meet the demand for life changing equipment for children in need. Thank you for your support and helping to make a difference!